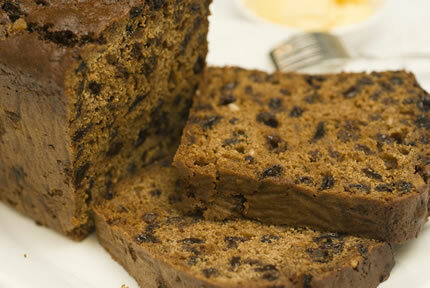 Bara Brith is wonderful on its own, or toasted and served with lashings of butter...there I go again, from my lips to my hips. Prepare the yeast batter by mixing 100g of flour, the castor sugar, fresh or dried yeast and warm water together in a large bowl. Cover and set aside until frothy, about 20 minutes in a warm place, longer in a cool place. Mix the remaining flour with the salt and mixed spice. Rub in the fat until the mixture resembles breadcrumbs. Stir in the sugar and dried fruits. Add the flour mixture and egg to the yeast mixture and mix well to form a soft dough, adding extra flour if the dough is too sticky to handle. Turn the dough onto a lightly floured surface and knead for about 10 minutes by hand or 2-3 minutes if you are using a mixer with a dough attachment. Shape the dough into a ball and place in an oiled polythene bag. Leave to rise until doubled in size - about 2 hours at room temperature and less in a warm place. Turn out onto a lightly floured surface and punch the dough down. Knead for 2 minutes. Divide into 2 pieces and shape to fit two well greased small loaf tins. Cover and prove until the dough stands 1 inch above the top of the tins. Bake in the centre of a moderate oven (180°C) for about 50 minutes. Remove from the tins and place on a wire rack. Brush the tops of the hot loaves with a wet brush dipped in honey or with a sugar glaze.